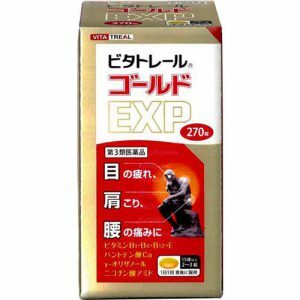 If you are reading up on my article right now, I assume that you are looking for some good Made in Japan muscle pain medication. Well, to be honest with you, I’ve never had the opportunity to take muscle pain medication in my life, so I can’t really speak about my own experience. However, the reason why I started looking into some Made in Japan Muscle Pain medication is because of my parents and grandparents. Every time I go home, I have a hard time coming up with souvenirs for my family. One day, when I was speaking over the telephone with my mom, she mentioned that her friend purchased some really effect muscle pain medication in Japan, and because my dad and my grandmother has muscle pain problems, she was wondering whether I could bring some made in japan muscle pain medication back home. Well, it turned out to be a hit souvenir for my dad and my grandmother, and my dad is still raving about effective it is. Today I am going to introduce the Top3 Made in Japan Muscle Pain Medication! This muscle pain medication was recommended to be by the pharmacist working at the shibuya drugstore, and it is the first muscle pain medication I bought for my family. It is effective against joint pain, back pain, neuralgia, etc. It helps the cartilage retain more water, and also giving the cartilage more of a spring, keeping your joints healthy. In addition, it also contains Vitamins such as B1, B6, B12, etc, which aids the nervous system function properly and improving blood circulation. If you know anyone with joint / muscle pains, you might want to give this medication a try. This muscle pain medication also works for tired eyes, stiff shoulders, back pain, etc. It contains vitamin B1, B6, B12 similar to Noibita Condoro Tablets. To be honest with you, I don’t really know what the difference between Noibita Condoro Tablets and Vita Treal Gold EXP is, and according to my dad, both of these muscle pain medications are just as effective. I guess it just works differently depending on the person, so you might want to try and compare the two products yourself. This muscle pain medication also contains Vitamin B1, B6, B12 and E. Vitamin B helps with fatigue, the nervous system, and is an essential component for your muscles to work efficiently, with vitamin B12 helping the fatigue of the eyes. 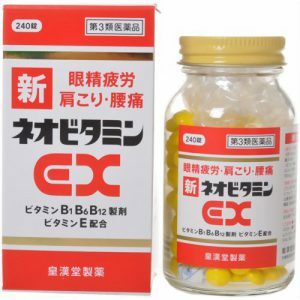 It seems that although all three muscle pain medication has similar components, but out of all of them I heard that New Vitamin EX Kunihiro is the most effective, so you might want to give it a try. ← Top 3 Made in Japan Migraine/ Headache Medication!